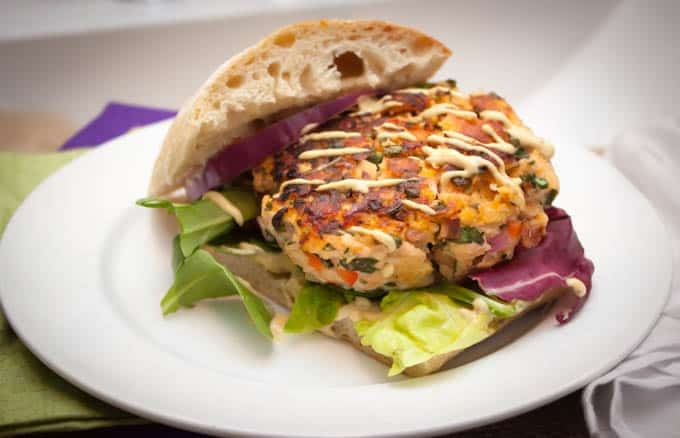 We make these amazingly delicious burgers for special occasions, small summer celebrations or when entertaining. However, they’re simple enough to make anytime if you have more self control than I do. I made them this weekend for our anniversary and, about two thirds of the way through the giant burger I had to admit that I was full but was going to keep eating, anyway. Shame… Mustardy, delicious shame. Brad gets the credit for the recipe development here – I just refined. Many years ago he set out to make salmon burgers but happily bought crab-stuffed salmon fillets. He also received the divine inspiration to pair the luscious result with a super tangy, addictive mustard sauce that we’ve perfected over time. 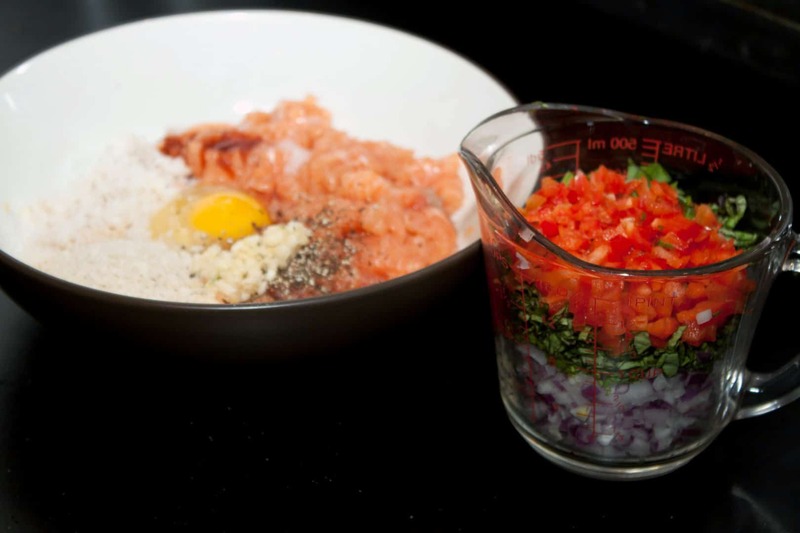 This recipe makes a ton of sauce but we still end up scraping the bowl at the end. Make these this summer, gorge yourself, and, as you’re licking the sauce off your greasy fingers, take comfort in the fact that these are less than 350 calories a serving, gluten free, paleo-friendly and a good source of omega-3s. I lighten them up even more with light mayo and the result is just as crazy yummy. In a large bowl, combine all ingredients except olive oil. Mix well and divide into quarters. Shape each quarter into a patty. Heat a large pan over medium heat and spray with olive oil. Add the patties and cook until bottoms are browned, about 5 minutes. Turn and cook until the other side is brown and the burger is cooked through, another 5 minutes or so. 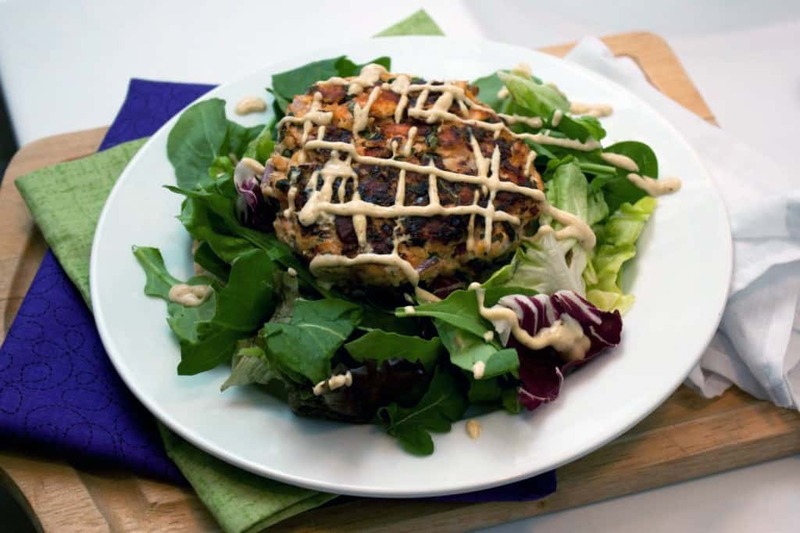 Serve burger with mustard sauce on a bed of greens or on toasted ciabatta. This recipe has to be in the top 5. The spicy mustard is great. We’ve made it a few times and changing up the mustard alone yielded some good results. Zataran’s was actually a little less spicy than straight up dijon. I’d say get a spicy mustard that you are comfortable with, heat wise, and just roll with that. 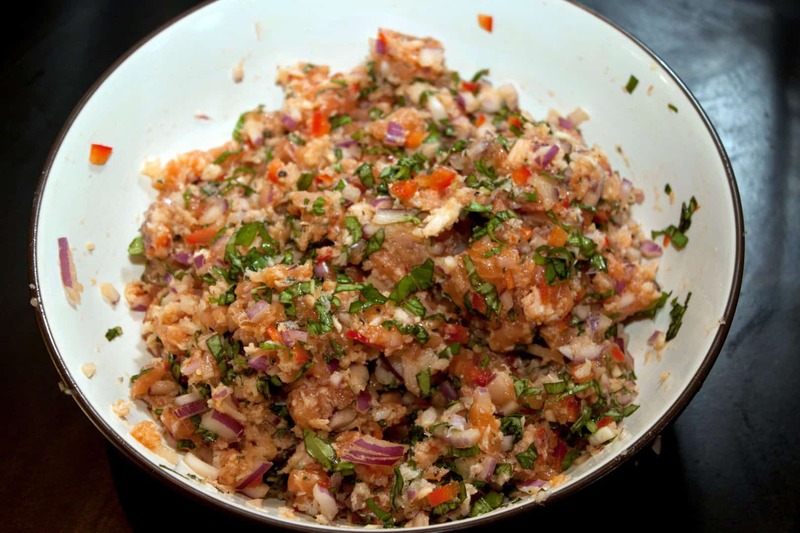 I’ve eaten this recipe and they are absolutely delicious! 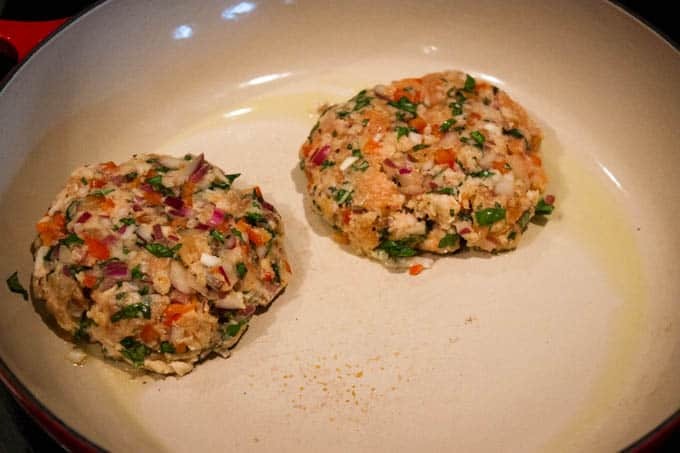 These Home Sweet Jones Salmon Crab Burgers cannot be beat! Haha! Thanks so much! Can’t wait to see you in a couple months! Awesome, Dave! I love the site! Such gorgeous pictures. I can’t wait to check them all out! Just curious as to why this recipe is so high in carbs. The recipe does not include a bun, breadcrumbs etc. ?? Hi Sarah! Overall I’d say <15g of carbs is pretty low but I can see how it's surprising when the main ingredients are salmon and crab. I'm just very meticulous about tracking and all those tiny carbs from the onion, red pepper, basil, mayo, etc. add up. If you're tracking closely, you should of course use a food scale and determine your own exact macro counts - you can certainly reduce those ingredients with trace cabs without hurting the end result too much.